Santiago (Spanish: Santiago de Chile?·i), is the capital and largest city of Chile, and the center of its largest conurbation (Greater Santiago). It is located in the country's central valley, at an elevation of 520 m (1,700 ft) AMSL. Although Santiago is the capital, legislative bodies meet in nearby Valparaíso. Throughout this article the term Santiago will normally refer to the Greater Santiago area; however, there are several other entities which bear the name of Santiago and need to be explained: The commune (comuna) of Santiago (sometimes referred to as Santiago Centro), is a subdivision of the Santiago Province, which is itself a subdivision of the Santiago Metropolitan Region. Greater Santiago includes the majority of the Santiago Province, and some areas of neighboring provinces (see Political divisions). The Great Santiago inhabitants are called Santiaguinos/as. The commune of Santiago is administered by the Santiago municipality (Municipalidad de Santiago), a separate legal entity with an elected mayor and council. It encompasses the oldest part of Greater Santiago—that enclosed by old rail lines—including downtown, and houses all major government infrastructure, including the government palace La Moneda. It has an area of 22.4 km2 (8.6 sq mi) and a population of 200,792 (2002 census). The Founding of Santiago by Pedro de Valdivia by Pedro Lira (1889). Santiago was founded by Spanish Conquistador Pedro de Valdivia on February 12, 1541 with the name Santiago del Nuevo Extremo, as a homage to Saint James and Extremadura, Valdivia's birth place in Spain. The founding ceremony was held on Huelén Hill (later renamed Cerro Santa Lucía). Valdivia chose the location of Santiago because of its climate, abundant vegetation and the ease with which it could be defended—the Mapocho River then split into two branches and rejoined further downstream, forming an island. The first buildings were erected with the help of the native Picunche. The south bank of the Mapocho River was later drained and converted into a public promenade, known as the Alameda (now Avenida Alameda Libertador Bernardo O'Higgins). The city was built following the traditional Hispanic grid pattern used in American colonies, made up of 126 square blocks of 138 varas (115 m) in length separated by 12 vara (10 m) wide lanes. A main square was located at the city's center, along with a chapel, some warehouses, and the dwellings of the most important residents. The first settlers formed a cabildo or town council for administrative purposes. The Santiago council became the administrative center of all of Chile, while Spanish forces continued their conquest southward. The Council was freed from its executive and military power when the Spanish King named a new governor for Chile. Because the governor had its residence in Santiago, the city became the capital of the Kingdom of Chile. The first few years of settling were harsh and proved to be a great endeavor. Mineral wealth was rare, the near surroundings did not provide sufficient food, and the indigenous inhabitants fiercely refused to be subjugated by the invaders. On September 11, 1541 the city was completely destroyed by native forces under the chief Michimalonco, endangering the whole process of colonization. During the 1550s Santiago was able to consolidate its position thanks to the construction of the Port of Valparaíso, which allowed for speedier reinforcements and provisions from Peru. It also became more peaceful as the conflict with the Indians moved south, which gave the inhabitants more time and resources to invest in the city. The Spanish King acknowledged this progress and conferred Santiago the title of city along with a coat of arms in April 5, 1552. With the Disaster of Curalaba in 1599, several settlers from the south of Chile took refuge in Santiago, and the city's population grew exponentially. The city was severely damaged by earthquakes in 1647 and 1730. During the War of Independence (1810–18), in the Battle of Maipú, which was fought south-west of the city, there was only slight damage. Santiago was named capital of the republic in 1818. During the early 19th century, Santiago remained a small town with few buildings excepting Palacio de La Moneda, the building used as the colonial mint, and a few churches and other civic buildings. The Iglesia de la Compañía de Jesús caught fire during an 1863 church service, and 2000 people died, one of the worst modern fires. In the 1880s, extraction of nitrate fertilizer in Northern Chile brought prosperity to the country, and promoted the capital city's development. Important landmarks were built in 1910 during the Centennial celebrations of independence from Spain, such as the National Library, the Museum of Fine Arts and the Mapocho Train Station (Estación Mapocho, now an events center). Santiago began its transformation into a modern city in the 1930s, with the building of the Barrio Cívico, surrounding Palacio de La Moneda. The city also grew in population, due to migration from the north and south of Chile. In 1985 an earthquake destroyed some historically significant buildings in the downtown area. Nowadays, Santiago is among the largest and most important financial centers in Latin America. The city lies in the center of the Santiago Basin, a large bowl-shaped valley consisting of a broad and fertile plain surrounded by mountains. It is flanked by the main chain of the Andes on the east and the Chilean Coastal Range on the west. On the north, it is bound by the Cordón de Chacabuco, a transverse mountain range of the Andes, whereas at the southern border lies Angostura de Paine, where an elongated spur of the Andes almost reaches the Coastal Range. Santiago Basin is part of the Intermediate Depression and is remarkably flat, interrupted only by a few hills. Among those are Cerro Renca, Cerro Blanco and Cerro Santa Lucía. The Andes mountains around Santiago are quite tall, culminating in Tupungato volcano at 6,570 m (21,555 ft). Other volcanoes include Tupungatito, San José and Maipo. Cerro El Plomo is the highest mountain visible from Santiago's urban area. 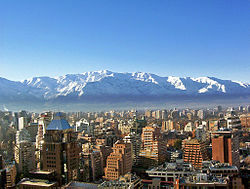 Santiago has a mild Mediterranean climate: relatively hot dry summers (November to March) with temperatures reaching up to 35 degrees Celsius (95 degrees Fahrenheit) on the hottest days; winters (June to August) are more humid with cold mornings, typical maximum daily temperatures of 15 degrees Celsius (59 degrees Fahrenheit), and minimums of a few degrees above freezing. Occasional snowfall occurs in the city, and may extend throughout the city, though this happens infrequently (about every 8-10 years). Mean rainfall is 360 mm per year and is heavily concentrated in the cooler months. Thermal inversion (a meteorological phenomenon whereby a stable layer of warm air holds down colder air close to the ground) causes high levels of smog and air pollution to be trapped and concentrate within the Central Valley during winter months. In the 1990s air pollution fell by about one-third, but there has been little progress since 2000. As of March 2007, only 61% of the wastewater in Santiago was treated, which increased up to 71% by the end of the same year. However, the Mapocho river, which crosses the city from the north-east to the south-west of the Central Valley, remains contaminated by household, agricultural and industrial sewage, and by upstream copper-mining waste (there are a number of copper mines in the Andes east of Santiago), which is dumped unfiltered into the river. Laws force industry and local governments to process all their wastewater, but are loosely enforced. There are now a number of large wastewater processing and recycling plants under construction. There are ongoing plans to decontaminate the river and make it navigable. Santiago by Human Development Index on a commune-basis. Greener is higher. The blue line divides the formal areas of the city. Population of Santiago from 1820 to 2020. The population of Santiago's urban agglomeration grew from 0.982 million in 1940 to 2.82 million in 1970 and 4.75 million in 1992. According to the 2002 census, it contains a population of 5,428,590, equivalent to nearly 36% of the total population of the country and 42% of the total urban population, making it one of the largest cities in Latin America. Santiago, according to an estimate from 2009, has a population of 7.00 million people. Santiago is the industrial and financial center of Chile, and generates 45 percent of the country's GDP. Some international institutions, such as ECLAC (Economic Commission for Latin America and the Caribbean), have their offices in Santiago. In recent years, due to the strong growth and stability of the Chilean economy, many multinational companies have chosen Santiago as the place for their headquarters in the region, such as HP, Reuters, Procter & Gamble, Intel, Coca-Cola, Unilever, Nestlé, Kodak, BHP Billiton, IBM, Motorola, Microsoft, Ford, Yahoo!, and many more. Progress of the Costanera Center and Titanium La Portada in february 2009. The construction sector is booming in Santiago. Several large apartment complexes are being built throughout the city and construction cranes are a common sight. Currently under construction is the Costanera Center, a mega project in Santiago's Financial District. This includes a 280,000-square-metre (3,000,000 sq ft) mall, a 300-metre (980 ft) tower, two office towers of 170 metres (558 ft) each, and a hotel 105 metres (344 ft) tall. When completed in 2010 it will be the tallest building in South America. In January 2009 the retailer in charge, Cencosud, has said in a statement that the construction of the mega-mall would gradually be reduced until financial uncertainty is cleared. Near Costanera Center another skyscraper is being built, Titanium La Portada, and this will be 190 metres (623 ft) tall. Although these are the two biggest projects, there are many other office buildings under construction in Santiago, as well as hundreds of high rise residential buildings. Comodoro Arturo Merino Benítez International Airport is Santiago's national and international airport. 15 minutes from downtown through the urban highways (Costanera Norte-Vespucio Norte). Has rental car services, taxi cabs, transfer and buses available within the premises of the airport. Trains operated by Chile's national railway, Empresa de los Ferrocarriles del Estado, connect Santiago to Chillan, in the central-southern part of the country. All such trains arrive and depart from the Estación Central ("Central Station") which can be access by bus or subway. Bus companies provide passenger transportation from Santiago to most areas of the country, while some also provide parcel-shipping and delivery services. Terminal San Borja: located near the Metro station "Universidad de Santiago"
Terminal Los Heroes: located near the Metro station "Los Heroes"
Terminal La Paz: located in the municipality of Independencia, the closest Metro station is "Puente Cal y Canto"
Toll road, inter-urban free flow highways connect the city's extremes, including the Vespucio Highway (which surrounds the city describing a semi-circle), Autopista Central (which crosses the city in a North-South direction), and the Costanera Norte (which runs from the eastern edge, in Las Condes to the international airport and the highways to Valparaíso on the western side of the city). Currently with 107 operating stations and 16 under construction, Santiago Metro is South America's most extensive metro system. The metro system serves the city of Santiago, Chile. The system carries around 2,400,000 passengers per day. The Santiago Metro has five operating lines. Two underground lines (Line 4 and 4A) and an extension of Line 2 was inaugurated during late 2005 and beginning of 2006. The system is under expansion, and extensions are going to be built on Lines 1 and 5 throughout 2009 and 2010. Transantiago is the name for the city's public transport system. It works by combining local (feeder) bus lines, main bus lines and the Metro network. It includes an integrated fare system, which allows passengers to make bus-to-bus or bus-to-metro transfers for the price of one ticket, using a single contactless smartcard. Taxicabs can usually be found on the streets and are painted black with yellow roofs; unmarked taxis may be called up by telephone (Radiotaxis). Colectivos are shared taxicabs that carry passengers along a specific route, for a fixed fee. Greater Santiago extends throughout 37 municipalities and covered 64,140 ha in 2002. The majority of Santiago lies within the same named province, with some peripheral areas contained in the provinces of Talagante, Maipo and Cordillera. Specifically, Santiago joins the cities of San Bernardo (Maipo province) and Puente Alto (Cordillera province) to form the Greater Santiago conurbation. The province of Santiago is divided into 32 municipalities (comunas in Spanish). Each municipality in Chile is headed by a mayor (alcalde) elected by voters every four years. The members of the municipal council (concejales) are elected in the same election on a separate ballot. Orquesta Sinfónica de Chile, dependent of the Universidad de Chile, performs in its theater. There are also various jazz establishments, the most notable being the Club de Jazz in Ñuñoa. The city has a very vibrant underground music scene. Some of its most popular venues are La Batuta in Ñuñoa and Blondie's disco in downtown Santiago. Because of its central role in the economy,social and political affairs of the country, the newspaper's coverage tends to focus in Santiago's news, even though there are several local newspapers in other zones of the country. The publishing industry in Chile is rather small and minorities (ethnic and cultural) most of time are not represented or are misrepresented in the pages of the newspapers. There are two important players in Chile: El Mercurio and Copesa. Both companies have a conservative and right-wing editorial lines, which tend to avoid discussing into much detail themes such as divorce, AIDS, sindical rights, aboriginal rights and subjects involving powerful companies or politicians. Both companies hold more than the 80% of revenues generated in printed advertising in Chile. Portillo is about three hours away. Some of the country's most important winegrowing areas lie in the nearby Maipo and Aconcagua Valleys. Several vineyards are located in this area. Most of Chile's population is Catholic and Santiago is no exception. According to the National Census, carried out in 2002 by the National Statistics Bureau (INE), in the Santiago Metropolitan Region, 3,129,249 people 15 and older identified themselves as Catholics, equivalent to 68.7% of the total population, while 595,173 (13.1%) described themselves as Evangelical Protestants. Around 1.2% of the population declared themselves as being Jehovah's Witnesses, while 0.9% identified themselves as Latter-day Saints (Mormons), 0.25% as Jewish, 0.11% as Orthodox and 0.03% as Muslim. Approximately 10.4% of the population of the Metropolitan Region stated that they were atheist or agnostic, while 5.4% declared to follow other religions. ^ "Chile Time". World Time Zones .org. http://www.world-time-zones.org/zones/chile-time.htm. Retrieved on 2007-05-05. ^ "Chile Summer Time". World Time Zones .org. http://www.world-time-zones.org/zones/chile-summer-time.htm. Retrieved on 2007-05-05. ^ Chile: Ciudades, Pueblos, Aldeas y Caseríos 2005, Instituto Nacional de Estadísticas - June 2005. ^ a b Llega Pedro de Valdivia al valle del Mapocho, Icarito. ^ a b El preludio urbano de la Colonia en Chile, 1541-1552. ^ "(English) Weather Information for Buenos Aires". http://www.worldweather.org. Retrieved on Dec 12 2006. ^ [|Revista Ecoamérica]. "Cruzada ambiental por el Mapocho limpio" (in Spanish). http://www.ecoamerica.cl/sitio/index.php?area=320. Retrieved on 2008-02-11. "permitirá pasar del 68 al 81% en el tratamiento de las aguas servidas"
^ [|El Mercurio]. "Región Metropolitana saneará el 100% de aguas servidas al 2010" (in Spanish). Fundación Terram. http://www.terram.cl/index.php?option=com_content&task=view&id=1689. Retrieved on 2008-02-11. ^ [|Comisión Regional Metropolitana del Medio Ambiente]. "Agua, Recurso Escaso y Vital" (in Spanish). http://www.conama.cl/rm/568/article-892.html. Retrieved on 2008-11-02. "se calcula que sólo el 77% de las industrias del país cumple con la norma de RILES existente"
^ "Mapocho urbano limpio: El río soñado" (PDF). http://www.revistabit.cl/pdf/44-47.pdf. Retrieved on 2008-11-02. "Proyecto Mapocho Urbano Limpio"
^ Fundación Futuro. "Proyecto Mapocho" (in Spanish). http://www.fundacionfuturo.cl/mapocho/galeria.htm. ^ [|Comisión Regional Metropolitana del Medio Ambiente]. "Ruidos molestos en Santiago" (in Spanish). http://www.conama.cl/rm/568/article-921.html. Retrieved on 2008-02-11. "cerca de un 70% de la población santiaguina está expuesta a serias interferencias de su sueño por ruido que excede 65 dB"
^ Pedro Oyola. "the role of monitoring in air quality management". http://www.conama.cl/rm/568/articles-42825_recurso_2.pdf. ^ a b Alexander Galetovic; Pablo Jordán (Summer 2008). "Santiago: ¿Dónde estamos?, ¿Hacia dónde vamos?" (in Spanish) (PDF). Estudios Públicos. http://www.cepchile.cl/dms/archivo_3739_1932/r101_galetovic_santiago.pdf. This page was last modified on 8 April 2009, at 04:10 (UTC).